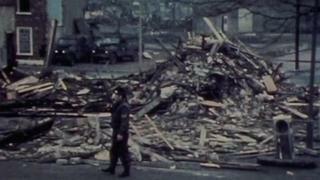 A 75-year-old man has been arrested over a pub bombing in which 15 people were murdered during the height of the Troubles in Northern Ireland. The man was detained in east Belfast and taken to Antrim police station. A PSNI spokeswoman said families of the victims have been informed of Wednesday's arrest. The officer leading the renewed investigation, Det Ch Insp Justyn Galloway, said: "Despite the passage of time, there remain a number of opportunities to make progress. "We will do our best to develop these lines of enquiry as thoroughly and quickly as possible. "At the same time, I would ask those individuals who know who was involved in this attack on 4 December 1971 to talk to us. "Much has changed in the four decades since this terrible atrocity but the families of the victims and survivors continue to suffer. "I would ask that anyone with information or suspicions about this bomb attack to come forward," he said.